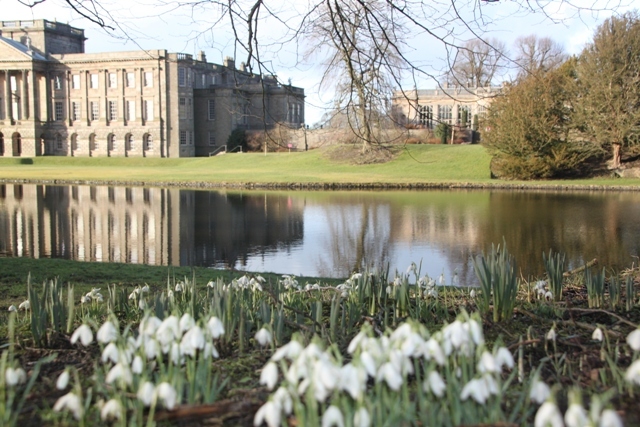 Lyme Park is lovely – a huge estate, managed by the National Trust nestling on the edge of the Peak District – perfect Sunday strolling territory. 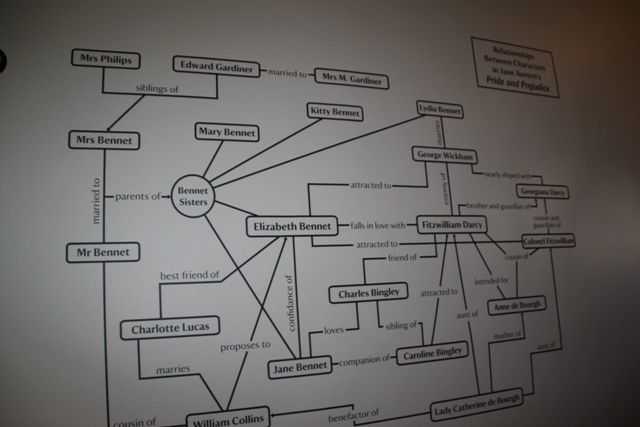 The draw for me though, being a fan of all things Jane Austen was “The Only Way is Pemberley” exhibition. 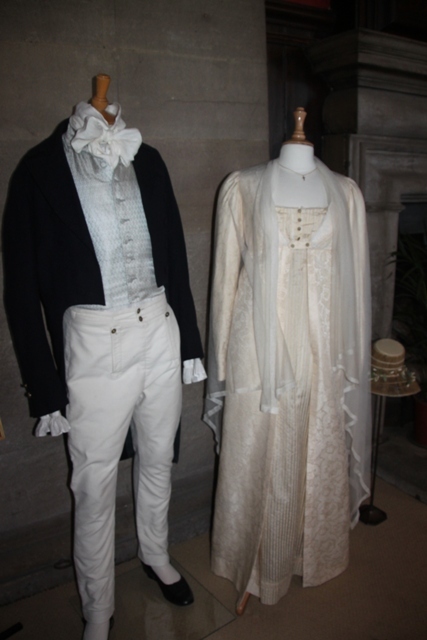 The Pemberley exhibition celebrates 200 years of Pride and Prejudice and as an added extra it is nearly 20 years since Lyme Park featured as Pemberley in the BBC series. It was filmed here in 1995 and yes, the lake here is the very one from which a certain soaking wet Mr Darcy emerged in all his glory. The house is magnificent, the largest mansion in Cheshire and once home to the Legh family. It was still closed for winter during our visit, so unfortunately we only got to explore a couple of rooms where the exhibition was located. 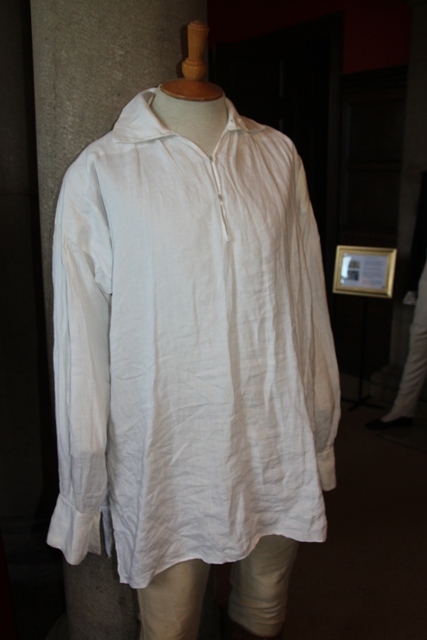 They had costumes from the BBC series on display, including Elizabeth’s wedding dress and the famous white linen shirt donned by Colin Firth in “that” scene. They also had lots of information about Jane Austen and her life. Son was surprisingly interested, lapping it up and not taking his usual whirlwind in and out swiftly approach to these things. Next door they had a big rail with Regency costumes of all sizes for adults and children alike to try on. Everyone was getting into the swing of it. You were encouraged to go outside in all your finery and take pictures in the courtyard. Clad in walking boots and full winter kit, Husband and I decided to give this a miss and take photos of other people instead! Son did get dressed up, but didn’t hang around in one place long enough for a (decent) photo. We had a look at some of the contemporary art themed around Lyme Park’s link to Pride and Prejudice, but that really did it for Son and outside we had to go. 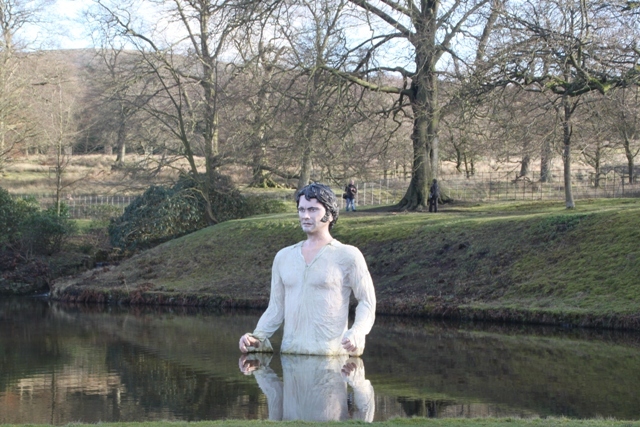 In the gardens we were greeted by the sight of a huge Mr Darcy emerging from the lake. 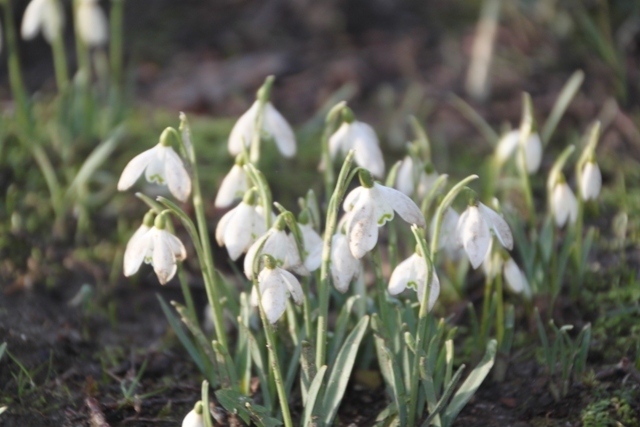 We walked around the lake, got some lovely views back to the mansion and saw snowdrops. 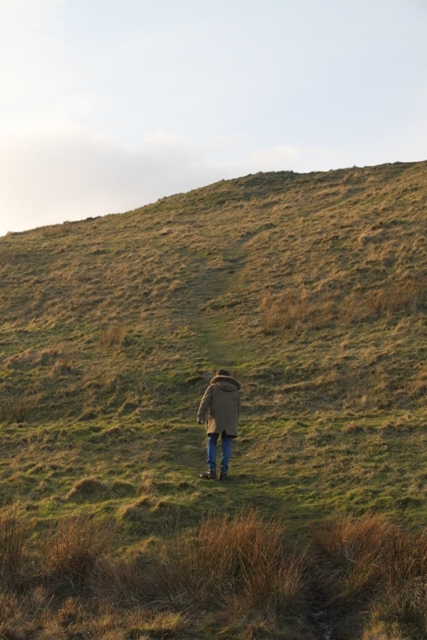 The Lyme Park estate is 1,300 acres and home to a herd of red and fallow deer. On such a glorious afternoon, we decided to explore further and go hiking. Son was definitely not impressed with the idea of a long walk, but choice was not a factor here. We hiked up a couple of steep hills and enjoyed views of Cheshire below. 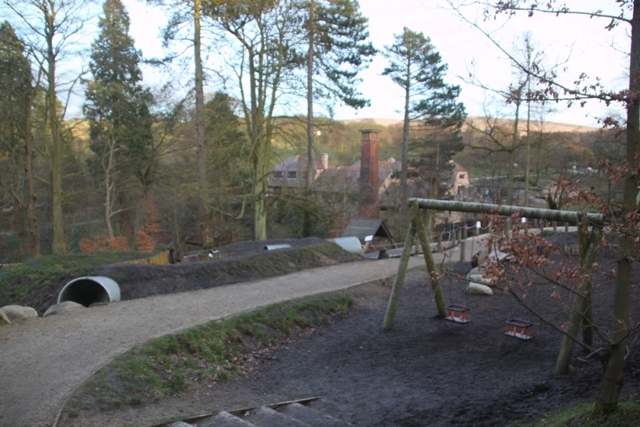 Son miraculously found an abundance of energy at the end of the walk when we took him to Crow Wood Adventure Playground. 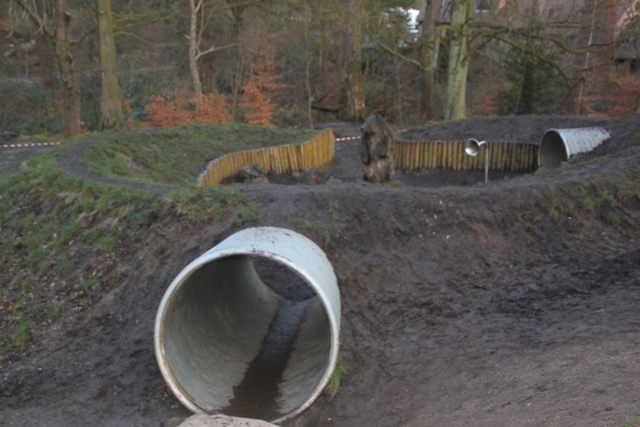 A giant slide, badger den and rope walk and the opportunity to get muddy beyond belief was a perfect end to the day for him. ← National Railway Museum – Not Just For Trainspotters! I admit that I never have watched Pride and Prejudice but your post made me want to. Yes super size Mr Darcy is definitely freaky! Every winter there is something different in the lake, depending on the exhibition. Last year it was a Beatrix Potter theme and Peter Rabbit was in the water. Sounds cuter, but a huge bunny out there…. also the stuff of creepiness! What a treat! I love the BBC production. Will definitely add this to my can’t miss list! Definitely great if you are a fan of the series! Will put this on the list to visit. But that photo with the reflection would be so much better without the creepy guy! A 6 foot Mr Darcy is definitely more than a bit freaky! 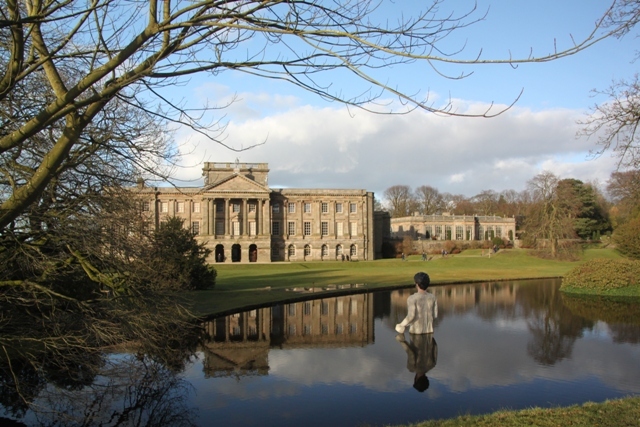 However he’s only in the lake during the Pemberley exhibition, when it closes the view goes back to normal again. Great read! I always like to finish at a playground, too. A little incentive that keeps the kids moving never hurt 🙂 The giant Mr. Darcy takes the biscuit, though! What a strange tradition to put different statues in the lake every winter. Wonder how that started? Incentives (bribes) always work for us! Not sure about the statues, but they help getting kids walking around the gardens! I find the statue less creepy and more hilarious! 🙂 Beautiful grounds. Truly lovely and wish I had something like that here! Thank you – our son thought it was also hilarious and he is easily creeped out!! The grounds are stunning and we managed to visit on one of the few days with a blue sky here recently. Seems like this really had something for everyone 🙂 We are definitely Pride and Prejudice fans (the adults at least), so this looks like something we would really enjoy. 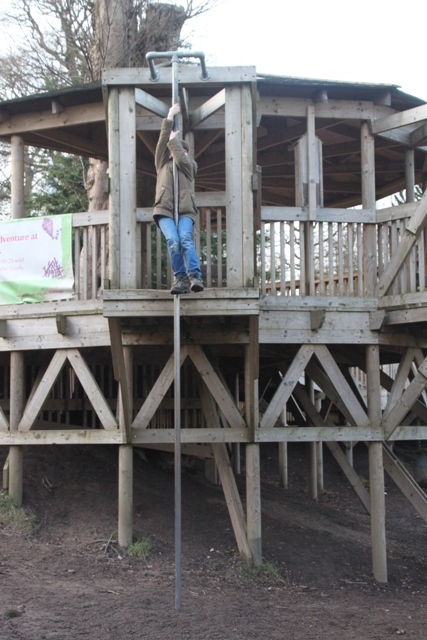 It was a lovely day out – we all enjoyed (something) about the day! I know, he seemed to creep a lot of people out!! But at least he’s only there for a short time and then normality returns. Oh wow, gorgeous pictures! I wish I could go – I love Pride and Prejudice. Mr Darcy looks a wee bit creepy coming out of the lake. 🙂 Beautiful post. Stuff of nightmares really – a giant man looming from the depths of a lake!! Thank you for reading. Oooh! Wish I’d been there, too. Dragged my two sons along on a Jane Austen tour in Bath. When they complained, I told them ‘One day your girlfriends will be really impressed with your Austen knowledge.’ That ad ice creams seemed to do the trick. Can’t wait to get here – thanks for the post! Bath is the ultimate place for Austen fans – would love to go there with my son too! Think I might use the ice cream trick as well though, it usually helps to save the day. Taking a Jane Austen tour is still on my bucket-list. 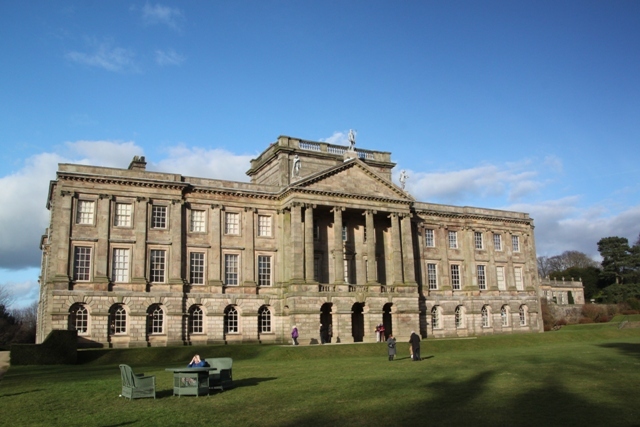 Loved the photos and info about Pemberley. P & P is my favorite movie of all time! Thank you – one of my favourite movies too!